Vitiligo is a skin disorder caused by a deficiency in melanin pigmentation. Melanin is the pigment responsible for the skin’s coloration. 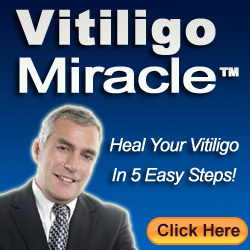 In vitiligo, the natural color of the skin turns pale or white because of the deficiency in melanin. The direct reason for the skin turning white is the death of melanocytes. The dead cells thus appear as white patches as the pigment can no longer be manufactured. This discoloration can sometimes affect the hair cells as well. This skin disorder has been found to affect men and women all over the world. Some doctors believe that the cause of this skin disorder is because of a lack of an efficient immune system. The exact cause, however, has not yet been determined. Our body’s immunity is responsible for preventing the occurrence of dangerous infections and contaminations. Immune deficiency is said to result in a number of health problems, and it can also lead to the death of melanin, causing vitiligo. The death of melanin cells on the top layer of our skin can turn the entire skin white. The discoloration is due to a lack of supply of nourishment to these cells. The nourishment to the cells is apparently blocked by certain factors, including sunlight, heat, and other microorganisms. Due to the increased incidence of vitiligo in families, this condition is said to be passed on from one generation to another. Normal skin can withstand only a certain amount of heat and other allergens. If the skin is exposed to some strong chemicals, it can easily kill the melanin cells, and the areas touched by the chemicals are the only areas affected. Corrosive acids are dangerous but there are also some other chemicals that can cause minor damage, such as those resulting in vitiligo. Sunburn is actually a skin disorder that is somehow related to vitiligo. The skin cells also are killed from prolonged exposure to sunlight. Additionally, if there is a cut on the skin, it can be exposed to infection. Notice that even though the cut is healed, a scar remains because the cells cannot benefit from a complete cure. When treating vitiligo, the skin should not be exposed to sunlight for a long time. Doctors also suggest that stress can become a cause for vitiligo. The type of vitiligo may be different for different people. The symptoms may vary, depending on the cause. When stress is experienced often, there is a high possibility of suffering from vitiligo because the nervous system gets damaged, and this effect causes the skin to receive abnormal impulses, resulting in the death of the cells. Viral infections to the outer layer of the skin can affect melanin. Viral infections on the skin could thrive as they feed on the melanin cells; the microorganisms get their nourishment from the melanocytes and use them as hosts. The viruses affect the growth of the melanin cells and gradually kill them. Thus, a virus can become a cause for vitiligo.